The BenQ HT4050 packs some truly impressive image output that comes pretty close to offering a personal theater experience. However, the HT4050 isn't perfect. There is no built-in wireless connectivity and you'll have to manually focus your projections. But those are pretty small gripes for what is otherwise an outstanding projector. 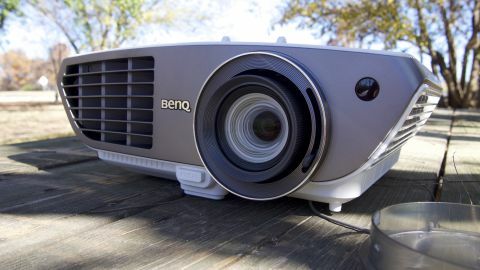 As the latest high-end projector from BenQ, the HT4050 ($1,399, £906, AUS$1,960) packs plenty of premium features that may strike the fancy of home theater enthusiasts and business professionals alike. Between its accurate color reproduction, surprisingly robust sound, and its bevy of inputs and controls, the HT4050's admittedly hefty price tag could be easy to justify depending on your needs. As for the competition, the HT4050 sits in the same space as the much more expensive Sony VPL-HW55ES ($3,999.99, £2,591.60, AU$5079.87), along with the ViewSonic Pro 8600 ($2,520, £1,500, AUS$2719) and Epson EX7235 Pro ($599.99, £385.24, AU$738.45). However, with the exception of Sony's option, this latest offering from BenQ looks to be the better option based on its image purity alone. Keeping that in mind, let's take a look at the design and performance of the BenQ HT4050 to see if it's worth the price tag. The BenQ HT4050 features a shell that is largely composed of a glossy white plastic with matte grey wrapping around the front, back and the top of the sides. Overall, the color scheme is unassuming, but it does look fairly slick and is worthy of some admiring before you put it to work. At the top of the HT4050, you'll find a compact grid of buttons for controlling the projector, including navigation buttons for the menu, a source selector and a power button. In addition, there are a set of dials that allow you to shift the lens slightly – both vertically and horizontally. Outside of that, there's a large BenQ logo, along with some DLP and CinematicColor branding. On the front of the HT4050, the large lens features prominently, with an IR sensor, another BenQ logo and large fan output. In addition, there is a convenient little push-button that allows you to control a small kickstand for further adjusting the vertical angle of the projector. The sides of the HT4050 are fairly nondescript, simply featuring large cutouts for fan intake and output. However, at the back, you'll find all of the ports you'll be using to blast your content onto the big screen. As for dimensions, the HT4050 is a fairly hefty beast, which should be alright considering you're unlikely to be hauling this guy around as often as something like a Pico projector. The projector weighs 9.26 pounds (4.2 kg), and measures 12.99 x 4.72 x 9.72 inches (WxDXH, 330 x 120 x 247 mm). The HT4050 is packing plenty of ports. On board, you'll find two HDMI ports – with one sporting MHL compatibility – component and VGA ports, audio in and out and a 3D Sync out port. Additionally, there's a USB Type-A port along with a mini USB port, but you'll only be using these for power and servicing, respectively. Oddly enough, the HT4050 also sports a serial RS-232 port if you're in need of one. On to the meat of the HT4050, the projector is packing a pretty powerful 2000 ANSI lumens bulb that is capable of putting out a contrast ratio of 10,000:1. The projection system itself is DLP, and the unit pushes out at a native resolution of 1920x1080, giving you a full HD picture. Projection size: Up to 196"